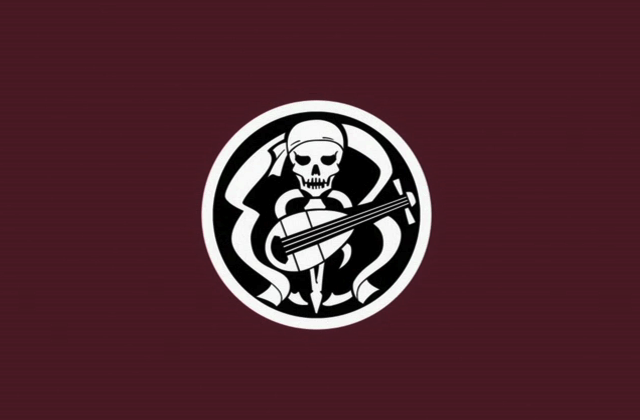 Formal wear for pirates in mourning. Bodacious Space Pirates (Mouretsu Pirates) was the series I was most looking forward to of the new shows to air in Winter 2012. I am very pleased to see that it has met my expectations. This show has done several things right so far. First, the setting is very interesting; it has the feel of being an advanced space-faring society without being unintelligible, full of magical pseudo-science, or cold. Second, the story, so far, has been far from predictable. And finally, though the cast does feature a lot of female characters, and thus some portions of the show could be categorized as moe, this is not a fan-service show. I’ll discuss these topics more below the jump. 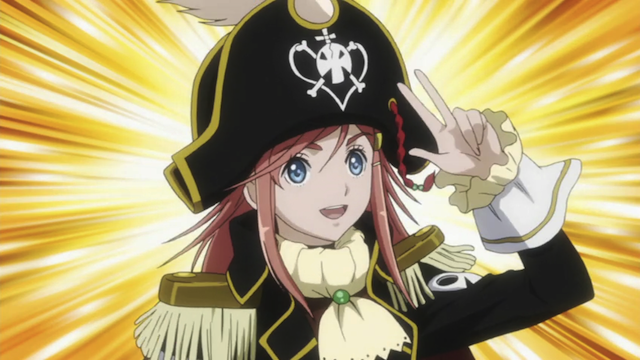 Marika Katou, heir to the captaincy of the space pirate ship, Bentenmaru. Our story takes place in a future when humanity has settled multiple worlds. In this future society, a relatively normal high school girl, named Marika, finds out that her parents were actually space pirates. In fact they were “legal pirates”, often known as privateers or corsairs. 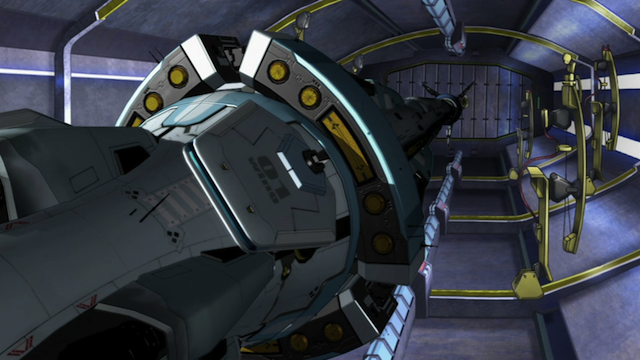 Essentially the planet she lives on (Sea of Morningstar) authorized the space ship Bentenmaru to attack other space ships as a means of supplementing its war efforts in a fight for independence. Though the war is long over, the “Letter of Marque” that confers privateer status to the Bentenmaru is still valid, as long as the captain is a direct descendant of the original captain. That awkward moment when you find an old photo of your mother from her space piracy days. So part of what makes the setting credible is the way they explained the concept of legal piracy. Another is the way that advanced technology is worked into their everyday lives. Display and input systems are advanced, but not utterly magical. Unlike some shows, society still seems warm and welcoming, whereas unlike other shows, technology has impacted how people get around, and gain access to buildings. To me Bodacious Space Pirates strikes a good balance between a thoughtful consideration of what a society with advanced technology would look like, without either getting completely fanciful, or losing sight of something enduring in the way humans prefer to live. Odette II, the practice ship of the Hakuhou Girls Academy Space Yacht Club. Speaking of the technology, the space ships all look pretty good. The approach is surprisingly “hard SF”. There is discussion of the way EV suits handle safety protocols, and a lot of time is spent covering inspections of the ship, and various basic routines, such as pre-flight checks, and raising of the solar sails after disembarking. And this brings me to my second point. The storyline has gone in an unexpected direction. I think, when I heard about the show, I assumed we would have a single episode in which the background was provided, and then we would jump straight into life aboard the pirate vessal Bentenmaru. 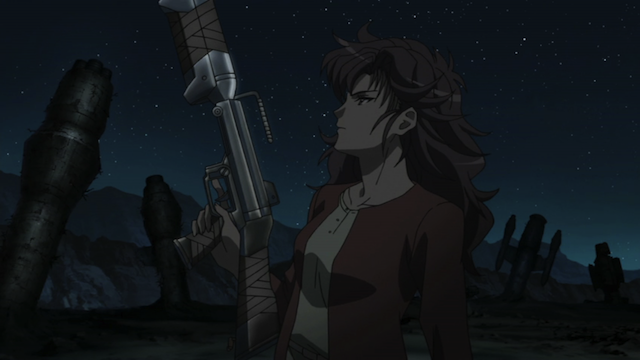 Instead Marika is (quite reasonably) reserving judgement on whether she should become a space pirate. 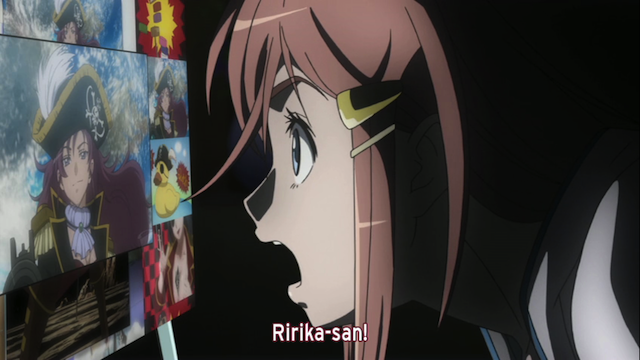 Although various shady characters have an interest in Marika, now that she is set to inherit a pirate ship, Marika is engaged in club activities. She is a member of her high school’s Space Yacht club. Thus her first time going into outer space is as a member of the crew of the Odette II. As the initial voyage gets underway, a malfunction in the mast deployment sequence results in a trip outside the ship to fix the problem. Bodacious Space Pirates is full of girls … girls in high school uniforms, girls in maid uniforms, and girls in skintight space suits. It is not, however, full of fan service. This might be surprising to some, as the name is really quite silly, and the scenario can seem tailor-made to focus on moe antics and mini-skirts. Now I want to be careful to avoid making it sound like there are no moe antics and no zettai ryouiki. I guess you could say the show is mildly risqué at times, but it is certainly tame in contrast to many shows out there. 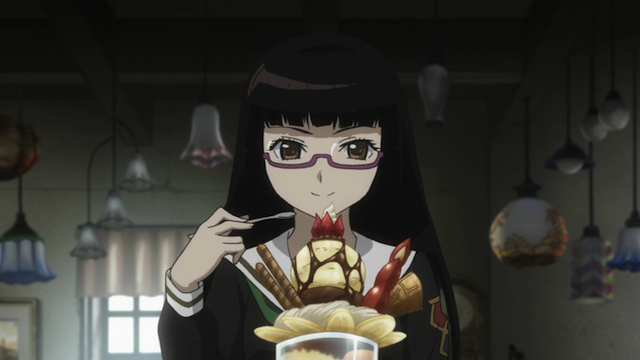 Chiaki Kurihara, a mysterious transfer student. 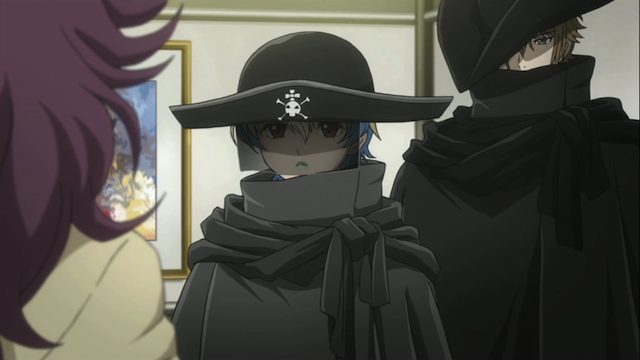 Misa Grandwood (left) and Kane MacDougall (right), pirates of the Bentenmaru. I haven’t said much about the characters, but we actually have been introduced to a lot of them already, and even more are featured in the OP. I guess the most important point is that Marika is fairly likable. She isn’t a know-it-all, but she is decisive, which is a good thing in a ship’s captain, and also in a main character. Marika’s mom is pretty cool. She clearly wants what is best for her daughter, including giving her the opportunity to make her own decisions. Chiaki is a bit of a tsundere, but she seems to have an appreciation of Marika’s better qualities. 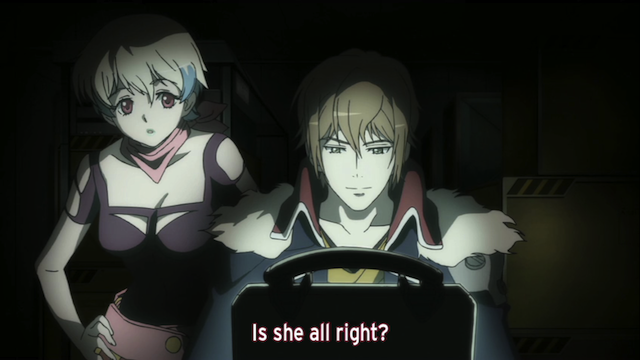 Misa and Kane are also quite likable. They clearly are trying to stay close to Marika to observe and protect her, and hope that she will agree to become the Bentenmaru’s captain. The series has gotten off to a good start. I think the story is moving in an interesting, and unexpected direction. The artwork and animation is pretty good. The background music has had a couple of interesting tracks including something that sounded like a reel, which carries a pirate story feel. I’m certainly planning to watch this show to the end. I’ve been looking forward to this series ever since I found out it was directed by Tatsuo Sato, who also did “Shingu: Secret of the Stellar Wars,” one of my all-time favorite anime. I completely agree with your point about presenting the society’s technology as being advanced without being magical. I’m very impressed with how well they’re pulling that off. It’s not an easy line to walk. Some people are already complaining that the show’s slow and boring, but I think the groundwork is being laid for some very exciting and interesting stuff to come. By giving us the background we’re getting now, the show’s going to be able to present us with situations both more complex and more interesting than the usual run-of-the-mill fare. At least, that’s what I’m hoping. I’ve never seen Shingu, so thanks for pointing it out (just put it on my Amazon wish list). I have seen some criticism about it being “slow”, but I flat out disagree. I think you could be right that they have been building a background that can be used in the future, but I actually liked (especially episode 3) for its own sake. Now, I should say, I’m an old geezer, and this kind of “hard SF” approach reminds me of old school anime, and some SF novels I read as a kid. I also think it makes the show much more grounded, by presenting drama around a ship malfunction, instead of swigging rum and gun battles. (Not that I am against the latter). Yeah, I’m an old geezer too. Cut my teeth on Heinlein, Clarke and Asimov — so I really enjoy the “procedural” aspects of the show as well. The SF in “Shingu” is more on the mystical side, but on the other hand it has the most likable collection of characters you’re ever apt to encounter. And a marvelously paced plot. Yep. I read a crazy amount of these and other authors when I was a kid. I also liked New Wave SF, and “Swords and Sorcery” (e.g. Fritz Lieber). No big surprise I turned out to be an anime fan. Actually one of my favorite anime series as a kid was Star Blazers (AKA Space Battleship Yamato). A fair and accurate assessment of the anime. And you actually cleared up a bit of the plot for me that I missed (that to keep their privateer status, they need Marika to assume the role of Captain). Thanks for that bit. Not really anything objective to add here but I will say the series has surpassed my expectations and is one of my favorites for this season. Glad to see you feel similarly. Frankly I expected the show to be much sillier, but was hoping that I could overlook that because I enjoyed the concept of pirates in space. Instead the show has much more substance and I think that really works to its credit.